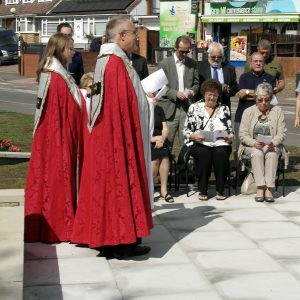 A service of re-dedication has taken place to mark the completion of work on the war memorial in Farm Hill Road, Waltham Abbey. Friday’s service was lead by the Rector of the Abbey Church, Waltham Abbey, the Rev’d Peter Smith. Among those attending were Waltham Abbey Town Mayor councillor Jeanne Lea, Cllr Eddie Johnson, Vice-Chairman of Essex County Council, town and district councillors and representatives from the local branch of the Royal British Legion. The work includes the laying of new paving stones and the jet washing and re-pointing of the war memorial. The war memorial also features a new plaque which indicates the site of the one-time war memorial hospital. Planting, which includes a floral bed currently depicting the number ‘100’ to commemorate the end of the Great War, has been carried out by the town council’s grounds staff. 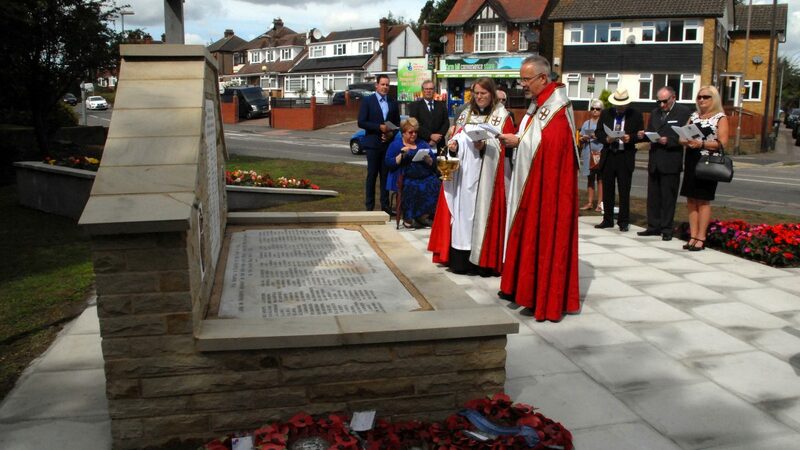 The Mayor, Cllr Mrs Lea said “Waltham Abbey Town Council is delighted with the work which has been carried out on the war memorial, and it is fitting that this facelift coincides with the 100-year centenary of the end of the First World War.